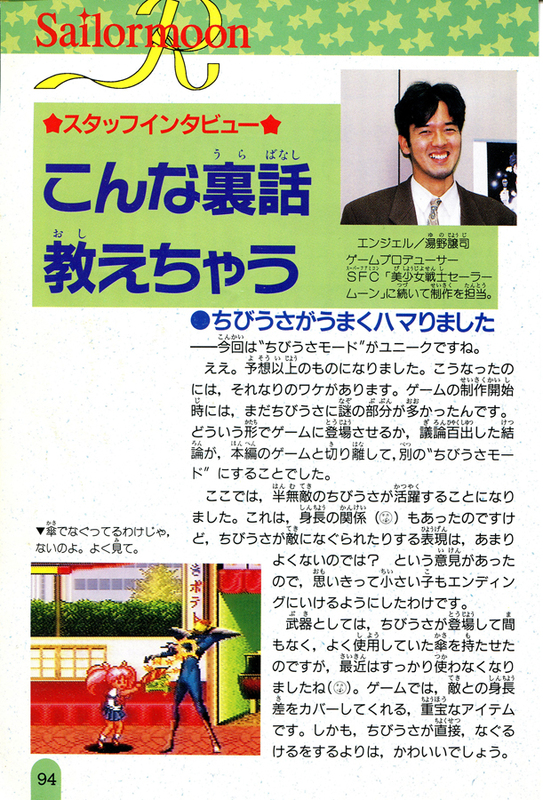 Continuing with his work on “Sailor Moon” for the SFC. — That “ChibiUsa” mode is pretty unique! 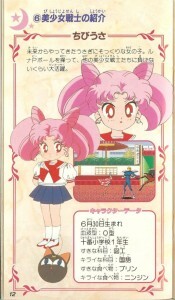 In this mode, you play as the near-invincible ChibiUsa. This was partially related to her height (laugh), but since we that though that it really wouldn’t look so nice to have ChibiUsa get punched by the enemies, so we made it so that even a little kid could make it to the end. We decided to have her use the umbrella she’s had since her appearance as a weapon, but she’s stopped using it entirely lately (laugh). In the game, the umbrella is really important to her since it makes up for the difference in the enemy’s height. What’s more, it’s a lot cuter than ChibiUsa directly punching and kicking the enemies. However, from the point of view of child-rearing, it’s not ideal to be hitting enemies directly with an umbrella, so she attacks the enemies with the energy from the stars that come shoot from the umbrella. 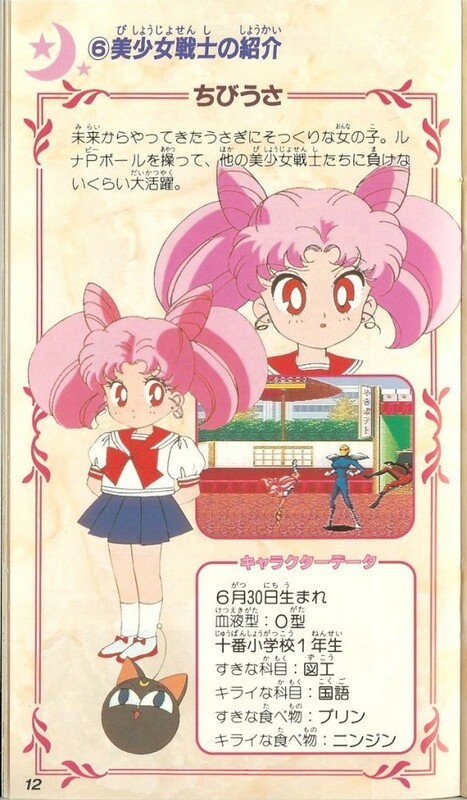 As much as we worried about how to fit ChibiUsa into the game, it paid off and people fell in love with it. — What about the other Sailor Soldiers? More than anything else, it was incredibly difficult to think of new moves in this game since we struggled so hard in thinking of attack moves in the last title. However, we did bring back those moves from the last title which we couldn’t put in due to space issues. Mars’ hajaenbukyaku (破邪炎舞脚; lit. evil spirit flaming dance kick) 2 is one of those. A woman’s sense was added to how the action was being shown on screen and I think it was beautifully done. 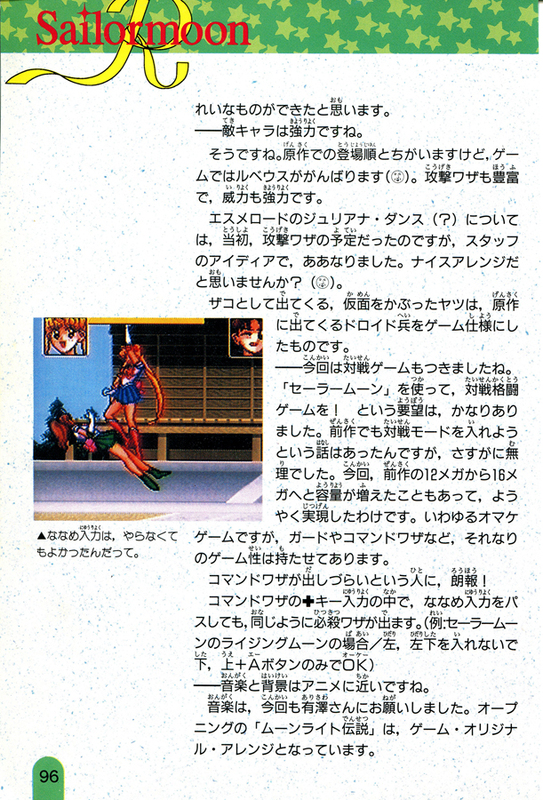 The special moves that damage all enemies on screen were from the anime content that had barely just debuted during game development. We borrowed the content and put them to actions, so we’re really glad the content wasn’t changed (laugh). But for Venus, we changed hers to the Crescent Beam Shower since we had put the Venus Love Me Chain in the last game. However, thanks to that, the Rolling Heart Vibration from the manga became her special move. As for how the joint attacks for two players came about, there are two reasons: the first being that, due to hardware reasons, the screen-wide damaging attacks from the single player mode could not be used in two player mode, and the second being that we didn’t want this to just be two players in the single player game and wanted to add meaning to the two player mode. We were also proud of our ability to be able to put in all these various moves, such as the hidden airborne special moves and others. Also, this time a woman was in charge of the graphics. A woman’s sense was added to how the action was being shown on screen and I think it was beautifully done. — Also, the enemies have gotten stronger, right? The mask-wearing, nameless enemies coming at you were taken from the droid army from the manga and used in the game. — I see you also added a fighting mode to this game. 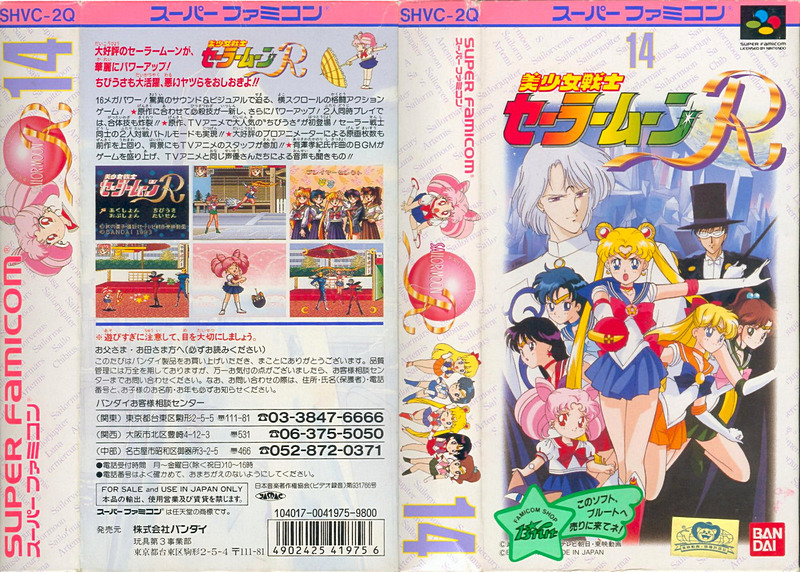 There was quite a demand to use the “Sailor Moon” franchise and make a fighting game. There was talk about putting a fighting mode into the previous title, but there was just no way. We finally were able to bring it about due to the increase in space from the 12 megabits in the last title to 16 megabits. It’s what you’d call an “extra mode,” but there are guards and special moves, so we made it a game in its own right, to some extent at least. — The music and backgrounds look like the anime, don’t they? For the music, we once again asked Mr. Arisawa to work on it. 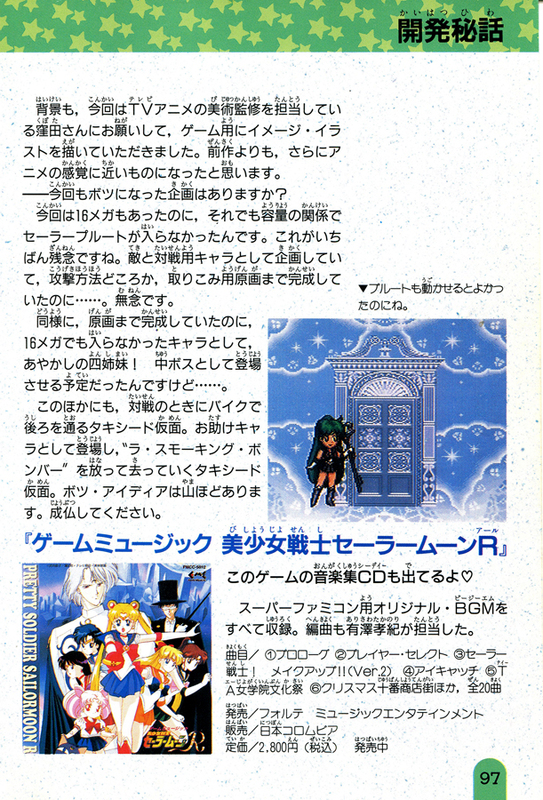 “Moonlight Destiny” in the opening is an arrangement original to the game. We also had the art director of the TV anime, Mr. Kumata, draw background illustrations for the game. I think that it has an even more anime feel to it than the previous title. — Are there any plans you had to cut this time around? Though we had 16 megabits this time, even then we still couldn’t fit in Sailor Pluto due to space, which is really unfortunate. We had planned for her to be a character to fight enemies and use in the fighting mode, and we had even finished the art for her moves, to say nothing of how she would fight. It really is a shame. 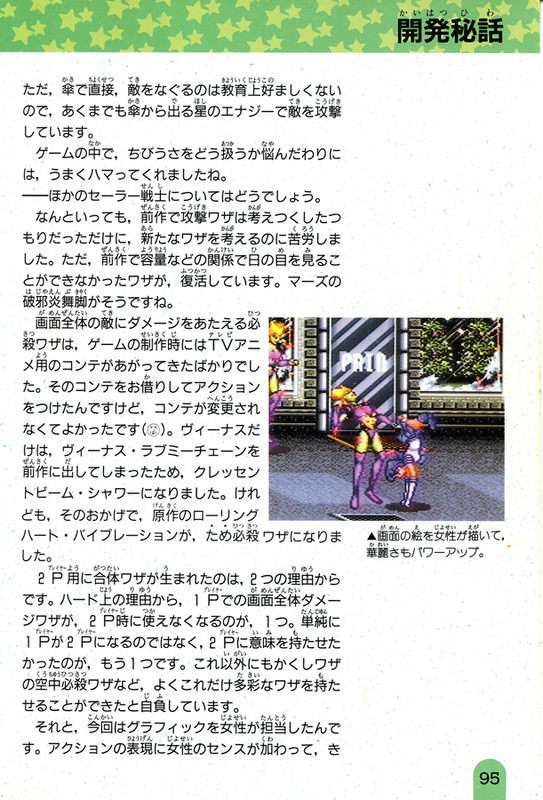 Other than that, there was supposed to be a Tuxedo Mask riding on a motorcycle passing by in the background during the fighting mode and Tuxedo Mask was also supposed to show up as a helping character, throwing a “La Smoking Bomber” before dashing off. There are so many ideas that we had to cut. I hope that you can forgive me. ← What Other Series Inspired Sailor Moon’s Title?